Is it possible that, as late as mid-October 2016, anyone is still on the fence regarding next month’s crucial presidential election between Hillary Clinton and Donald Trump? Apparently so, because NextGen Climate, a super PAC focused on the preservation of the environment and the election of green-friendly candidates, has recruited popular comedian Aziz Ansari to get the word out. And Ansari is not the least bit happy about this, let alone flattered that he was asked. 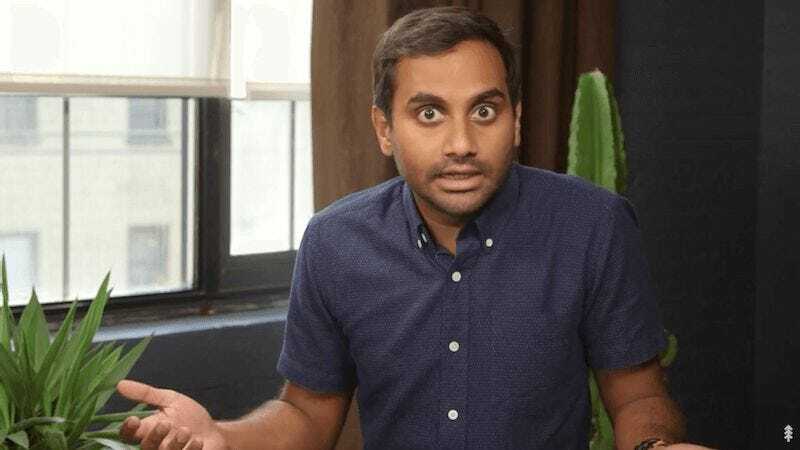 In his heavily bleeped, minute-long appeal, the Master Of None and Parks And Recreation star crankily lays out his case for anyone who hasn’t been paying strict attention to the news for the last year and a half. What the f*** do you need? How many celebrities have made these stupid f***ing videos? Robert Downey Jr. made one. DiCaprio made one. Jennifer Lawrence is in one. These people are way more famous than me! Why do you need me? (whiny voice) “Oh, Aziz! Some of the millennials are really responding to you. If you make a video…” Really? It’s gonna make a difference? There’s a f***ing guy running that says he hates brown people. What, that’s not enough? He doesn’t believe in climate change! Do you know how dumb you have to be to not believe in climate change at this point? So it sounds like Ansari will be voting Democratic in November and would like viewers to do the same, regardless of demographics. As deeply irritating as he finds all of this, Ansari is committed enough to the environment to make some personal sacrifices for the cause. “It’s my lunch break right now!” he exclaims at one point. That’s how important the 2016 election is. Instead of enjoying his lunch, this show business legend is sitting in front of a cactus in some dimly lit office, trying to get people to vote on November 8. May his suffering not be in vain.